From Glenn Gould Variations: Glenn Gould by Himself and His Friends. Toronto: Doubleday, 1983. THOUGH THE WORLD OF MUSIC and art has always been thought to thrive on novelty, history teaches us that it often rejects the imaginatively new simply because it is too new. Examples are limitless, but I have in mind something that interested me back in the late 1950s. It was then common to complain that virtually all of the younger generation of pianists (and not only pianists) were musically indistinguishable from one another. All very fine technically, so the story went, but what of spirit? They all played like machines, devoid of temperament, of individual personality. Generally speaking, I agreed. A child of the LP era, I nevertheless lurked in dusty record shops searching out the 78 discs of de Pachmann, Rosenthal, Friedman, Lhevinne, Godowsky, and my pianistic idols, Rachmaninoff and Hofmann. However remote or scratchy the sound of those recordings, the performances they transcribed were full of musical life, the deeply personal testaments of musicians of character. But I soon learned that many who shared my interest in pianists of generations past seemed motivated more by nostalgia than by a desire to hear great artistry from any age. For most collectors, a musician could only be of interest if he was at least retired, and preferably dead. This attitude, though it involved the continued veneration of some of historys most admirable performing musicians, was  and still is  based more in a sentimental longing for a Golden Age of performance than it was in a continuing search for musical genius. Now, as fate would have it, it falls to us to be nostalgic about the artistry of Glenn Gould, a phenomenon so compelling, so unlike anything else in music in our time, that it is impossible to imagine that he will be forgotten. In fact, I would hazard that if there is any twentieth-century performing musician who is still listened to five hundred years from now, it will be Glenn Gould. His recorded legacy is as close as I can conceive to being a permanent contribution to the history of musical art as any body of performance produced since the invention of the phonograph. The artistry of Gould cannot, I believe, be thought about in the same way as we usually think about the work of other performers. In arguing this, I want to apply to Gould two terms which, since they are these days applied to everything from opera singers to sports cars, have practically lost all meaning. I claim that in a fundamental sense Goulds art is inimitable and significantly unique. Of course, carried to some ultimate point of analysis, every musical performance is inimitable, as in a trivial sense every snowflake is unique. Nevertheless, I defend these as significant characterizations of Goulds genius. The greatest artists inevitably invite imitation. Beethoven and Wagner pioneered forms and techniques of expression which were staggering in their own right and which could yet serve as models or patterns for other composers. Naturally, most of the followers produced much less impressive derivations. Many others, however, influenced by Beethoven or Wagner, did wondrous things themselves, while still working within forms inherited from their predecessors. Sometimes music that is modeled on some prior form will even be better than that in which the form itself was originated. Chopin, as is well known, did not originate the form of the nocturne, but took it over from its inventor, John Field, whose relatively uninteresting nocturnes sound superficially like Chopins. In this sense, there are inventive and original figures in music from whom we can learn, because they pioneered techniques or styles that can inform future generations. Their work stands as a foundation upon which can be built further creative efforts. The word pioneer is used here advisedly because such artists explore territory that others may further exploit later on. Thus they contribute to musical progress. When I say that Glenn Gould is inimitable I mean that his genius is not of this sort. He offers no techniques, methods, or patterns that could be utilized by other musicians to attain their own artistic ends. There is not, in my view, even a Gouldian style of playing which could profitably serve as a pattern for another artist. This may sound like a strange thing to say: when the art of a pianist is so arresting as Glenn Goulds, it is only natural to suppose that he would offer a model for others. But while Gould has inspired and will continue to inspire other musicians (just as the very different art of Artur Schnabel inspired the young Gould), he offers no pattern or blueprint for Gouldian interpretation. Consider what such a blueprint would look like if we could ever determine it: it might call for us to stress inner voices, roll a chord or two, or choose odd tempi. But that in itself would not make ones playing truly Gouldian. The problem would be which inner voices to bring out and where, or which odd tempi to choose. One thing that I have always found very striking about Goulds approach to music, from the 1955 Goldberg Variations to his most recent posthumous releases, is how ineffectual I have been in trying to anticipate even the superficial external features of his performances. One might expect that over twenty-five years of listening to the recordings of an artist would finally give one some small ability to predict how he would handle a piece of the standard repertoire. Yet right up to his last releases for example, his Brahms recording, I found myself powerless to predict even roughly Goulds approach. The Rhapsodies, Opus 79, are a case in point: those astonishing performances are unmistakably and indelibly the work of Glenn Gould, but never could I have guessed how he would interpret these pieces. Gould is in this respect so very unlike any of a dozen fine and famous virtuosos I could name. With the others I am certain I could, with fair probability, predict how their recordings of the Opus 79 Rhapsodies would sound. Again, this is not to deny that there is something sharply distinct about the pianism of Glenn Gould. The profoundly personal character of his music making and of the Gouldian style is not analyzable into a set of rules that might be applied by another artist. In this sense, Goulds playing is not playing of a certain kind, playing which could be attempted by another pianist who might bring it off as well as, or probably worse than, Gould. The best I can imagine another artist doing with a Gouldian approach is to produce a parody of it  atonal humming over super-fast Mozart, perhaps. 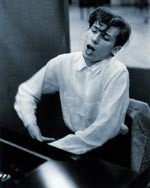 In fact, the art of Glenn Gould does not lie in any sort of replicable technique or method, but in a noumenal, indefinable substrate that underlies the external constraints of style and technique. Glenn Gould had a word for this: ecstasy. Ecstasy for him did not denote a special euphoric emotion that might be produced in the performance  or in listening to the performance  of a piece of music. Ecstasy is a state achieved when the performer goes beyond himself, beyond his technique, beyond the mechanical means of producing the performance, to attain a sublime, integrated view of the musical work of art. Gouldian ecstasy, as Geoffrey Payzant describes it, is a merging of self with the innerness of the music. Strictly speaking, ecstasy is a solitary condition, available to a performer and perhaps through him to an audience; for Gould, the solitary listening to recordings of music could make it accessible. But to the individual performer or listener, ecstasy is achieved when one stands outside of oneself, experiencing a uniquely coherent vision  which at the ecstatic moment must seem the only possible vision  of the music at hand. Goulds conception of ecstasy is consistent with his whole artistic personality. Glenn Gould was in certain respects both a romantic and an idealist. He was always dissatisfied with present possibilities, with the here-and-now and the ordinary and conventional. He gave up live concerts because he thought more life was possible beyond the confines of the concert hall, something attainable only through recording. He gave up ordinary recording because there were things that were possible for him only by taking over the actual production work, splicing and editing himself. He often played the piano as though he thought it a clavichord, or an organ, or a symphony orchestra. He could realize transcriptions of the Pastoral Symphony or the Siegfried Idyll as though they were Bach, and play a Bach prelude as though it were a Brahms intermezzo. He took some of the most emotional music ever written and revealed to us its purely rational inner logic, and he took some of the coolest and most academic of musical works and demonstrated that they too possessed a burning core of burning. In whatever he did, he shared with romantic idealism a will to transcend present possibilities, to reach out to some ideal conception which had never entered the more circumscribed musical imaginations of the rest of us. And so to the claim that Goulds art was not only inimitable, but significantly unique as well. Glenn Gould despised musical competitions. As Payzant has shown, he was profoundly anti-competitive in spirit; in music, his only competition was with himself to evoke an ever-clearer conception of the music. Gould was also an interpretative pluralist. He recognized that any number of equally valid interpretations of a musical score were possible. If such pluralism is taken seriously in critical practice, it follows that we must judge performances, or in any event Goulds performances as he conceived them, according to their own implicit internal standards of meaning and coherence, and not according to some external, perhaps historically established, tradition or paradigm. This view is not devised with an eye toward insulating Gould from criticism; applying it to his work does not require that we always praise. We may now and then find his playing awful. However, for example, his interpretation of a Mozart sonata is judged atrocious, it will not be found wanting because it fails to live up to some external convention of proper Mozart. It will be atrocious because it falls to pieces of its own accord, because it makes no coherent sense, because, in the last analysis, it does not achieve the ecstatic inner unity of self and music. It is an unhappy fact that the barrage of the criticism directed at Gould over the years has been undertaken in a very different spirit from this. A critic might compare, say, nine different recordings of a Chopin nocturne and, like a judge in an orchid competition, rank them from best to worst. Now if you have nine different Chopinists all playing within an established tradition, it can make sense to grade performances in this way; in fact, it can teach a lot both about individual players and about the tradition. But it has its pitfalls. At its worst, in this sort of competition the best recording may turn out to be that which most closely approximates what the critic was once taught was the right way to play the piece, or might be the reading which is most similar to the first recording of the nocturne the critic owned. These would be easily condemned cases of prejudice. But the problem is more insidious when we are confronting performances that have as their point the ecstatic inner coherence which Glenn Gould invariably tried to attain, especially when this involved deliberately ignoring established traditions of performance. This was a problem whenever Gould recorded works from the standard repertoire. Lucky, in a way, that his first Columbia disc was the Goldberg Variations. In 1955 so few music lovers had ever heard them that there was little problem with competing conceptions (only the usual cavils about Bach on the piano). But woe unto Gould that his next recording should be of the last three Beethoven sonatas; these performances had to be measured against the standard set by weighty German tradition, and particularly by the recordings of Schnabel. It is a wonderful thing for us all that Gould possessed such a stubborn independence of mind that he refused to be cowed by considerations of tradition and the proper way of performing the works of an established composer. The attitude I have described so misses the mark because Goulds art was based on the notion that completely different and equally sublime performances of the same work are possible. From him we had no pretense that his conception of a work of music was somehow the right conception. He would have recoiled from Landowskas jibe at another musician (Casals in one version of the story, Roslyn Tureck in another): You play Bach your way, and Ill play him his way. Even if we knew how Bach, or Beethoven, or Mozart performed their own works, these conceptions could not have for Gould a privileged or definitive place. In this respect, Glenn Goulds idealism is far from being Platonic in character: there is no one eternal form of the Beethoven Opus 111 Sonata. There are an indefinite number of ideals, each different from the others but capable of being revealed in a single ecstatic performance. The sense, moreover, in which each of these ideals is unique lies in the fact that they are not to be assessed according to some external super-standard: each sets its own standard of inner coherence. Goulds unending effort to achieve ecstasy by his own lights in whatever way he thought it might be revealed in a score, coupled with his refusal to bow to any tradition of performance, is the source of so much of the critical nonsense that has been written about him over the years. So often the dismissals of Goulds art involved the application to one of the supreme geniuses of twentieth-century performance a canon of criticism for a music student. In fact, the whole world of music is in my view oppressed by the heavy hand of authority (much more so than, for example, the realms of painting and literature). Every person who learns to play an instrument is sooner or later instructed about the right way and the wrong way to interpret some musical work. Beyond all those humble, but implicitly authoritarian, music teachers are the scholars who specialize in genres and composers, people who write learned books to tell us about the correct approach to this or that composer. How could we expect anything but misunderstanding  and intermittent outrage  in response to Glenn Gould, a performer who made it his point always to find a new way, and who refused to pay the mandatory obeisance to scholarship and tradition. I earlier expressed the belief that Glenn Gould has achieved a more lasting place in the history of music than any other performer since the invention of the phonograph. If true, this is because he was so much more a creative artist than other performers. In actuality, the distinction between creation and performance tends to disappear when properly considering his art. For Gould, performance was an act of creation. Further, his activity as a creative performer places responsibilities on us as listeners. Because of the power of his intellect and the scope of his imagination, Gould makes not only keyboard interpretation, but listening itself into an intensely active experience. I know of no pianist who required more of his listeners. They are never allowed to bathe passively in a pleasing wash of sound. They are to be surprised and provoked, and at those sublime moments thrown into the ecstatic state, moved by a stunning vision of the expressive unity of a work of musical art. The purpose of art, Gould once wrote, is the gradual, lifelong construction of a state of wonder and serenity. If his recordings are our evidence, Glenn Gould not only achieved this for himself: he made it possible for us to know his ecstasy. Copyright � Denis Dutton. All rights reserved.